Preheat oven to 350 degrees Fahrenheit. Grease a 9"x 13" baking pan with butter and dust with flour. In a stand mixer fitted with the paddle attachment, beat the butter on medium speed until soft, about 2 minutes. Add the granulated sugar and continue to beat until well mixed and creamy, about another 5 minutes. One at a time, beat in the eggs on medium speed until completely smooth and creamy, about 2 minutes. In a large bowl, combine the all-purpose flour, baking powder, baking soda and salt. Put the diced mango, buttermilk, and almond and vanilla extracts in a blender, and puree until completely smooth. In four additions, gradually beat the mango puree and the dry ingredients into the butter mixture, alternating wet and dry ingredients. Mix until completely combined. Scrape the batter into the greased and dusted baking pan and place in the oven. Bake for 30 minutes, or until the cake is golden brown on top, springy to the touch, and a wooden toothpick comes out dry when inserted. Remove from the oven and let cool. Turn the cake out upside down onto a board, and then flip right side up onto a platter. Dust liberally with confectioners’ sugar before serving, and garnish with berries of your choice. My daughter (5 y.o.) loves your show! We made this mango pound cake this weekend and it was amazing. She has an dairy allergy so I used almond milk based yogurt in place of the buttermilk and it turned out great. Nice, moist and fluffy texture. Also as an FYI to others here, I baked the cake in a bundt pan, increasing the cooking time to 45-50 minutes. I’m so happy you and your daughter loved the cake, Courtney! Just made this with gorgeous fresh Australian mangos, and it is divine!! I also used plain yoghurt instead of buttermilk and it worked perfectly! I will definitely be keeping this up my sleeve for future baking sessions!! Mmmmm fresh mangoes….so glad you loved the pound cake, Viviana. This is the best pound cake I never seen thank you. I’m sorry to hear that Linda. Olah patti. My daughter Lara and I watch your show together we had to try this recipe. We always like to follow the recipe but we used some spiced rum instead of vanilla omg so good.! Oh that sounds so good, Jorge! And say hi to Lara for me. Ahi ya yhi muchachita ….this recipe is simply delicious..my sister made this mango pound cake this morning, and she just brought us some to taste…muy rico..we loved it! We love your show and have tried many of your delicious recipes ! Yay! I hope you all continue to enjoy all of the recipes. Just watched your show can not wait to make the mango cake I love your show watch all the time . Thank you for tuning in Marie! I’m so glad you and the grandkids enjoy it so much, Cindy! 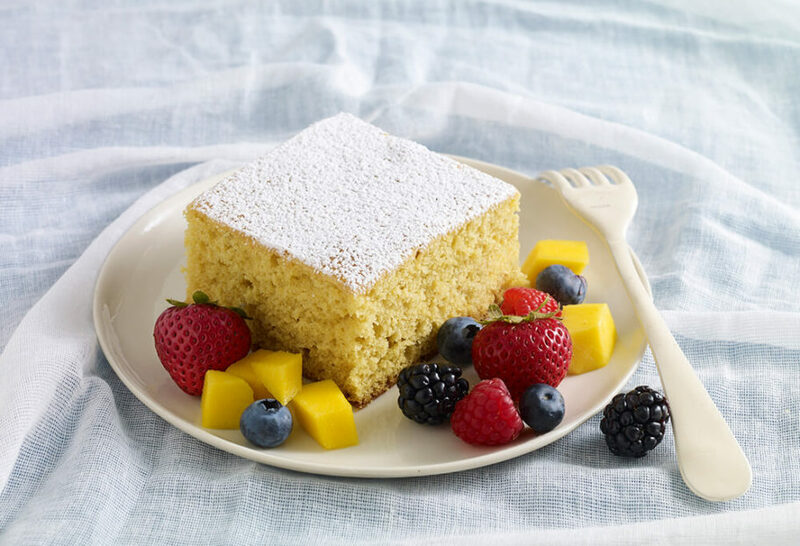 I was wondering if you think layering the bottom of the cake pan with tiny bits of mango would work, like a pineapple upside down cake and has this recipe been tried with Gluten free flour mix? ​That is a great idea, let me know how it goes! Is that 350 degrees “FAHRENHEIT (= to 177degrees C), or a typo error? Maybe you mean CELSIUS? Thank you. I made the Mango Pound Cake, and it didn’t rise as much as I was expecting it would. Any suggestions? I had tried two times and both times it comes with a strong baking powder/soda flavor, what am I doing wrong? I follow the recipe, could it be because I omitted the almond extract and just a little bit over a cup of sugar. Would you please tell me what could it be. Hmmm…I’m not sure. Make sure the mangoes you are using are sweet enough and you can change the baking soda for baking powder, but you will need to cook the cake for a little longer. Here’s my story. I saw your episode in making this cake and thought it would be perfect for a social event I was going to, but I did not have mango and decided on peaches. Than I found out I did not have peaches(canned, frozen nothing) pitch hit…. I had a jar of Balsamic Fig Chutney which I substituted for the mango adding in honey also. I came out wonderful; moist, lightly spicy and fig flavored. I love your program and it is inspiring me. Thank you so much Deb for sharing! So happy you are inspired. I haven’t made the cake yet but I do know Costco sells organic frozen mango chunks in their frozen fruit isle. I am sure they will be very sweet and ripe. Hope you enjoy the pound cake! I just baked this and it’s very good and moist. The only thing is that I wish it had more mango flavor. I’m thinking the ataulfo mangos weren’t ripe enough. The lady at farmers market said they’re ripe when yellow but maybe they need to be a deeper yellow? I’m so happy you liked the cake! The mangoes should be golden yellow when ripe. Pati, this was first try and made this delicious cake for my daughters birthday (at her request)- delicious ! Yes thank you for sharing your picture Carole! I’m so glad your daughter had a great birthday! I watch your show all the time. I just made the Mango pound cake and it was delicious. I plan on trying more of your recipes as soon as I get the ingredients I need. Susan, thank you so much for tuning in and for trying the recipes! Se le podia mesclar jugo de Naranja? Que piensa? Espero su respuesta y gracias Por su ayuda. I think I misread the instructions because I thought it meant to mix the dry/wet ingredients in the stand mixer. I must admit that I was quite nervous about using the stand mixer because it is so easy to over mix and get a dry cake (happens too often – you’d think I would learn). However, I made this cake today and got comments like “best cake I have ever had!” It truly was fantastic! I did use an extra tsp of vanilla extra instead of the almond extract (due to almond allergy). PS: Love your show – watch you on PBS (WNED). Hola Pati, I just made the Mango Pound Cake, had to omit the almond cuz didn’t have it on hand. I also substituted the buttermilk for whole milk plain yogurt. The cake is pure delight and the fresh mango comes through loud and clear. I dusted with powder sugar and a little bit of lime zest for color and that true Mexican flair. I recommend your recipes all of the time, every one I have ever made has been a success and oh so easy. Thank you Pati for coming to America and sharing your culture and beautiful family with all of us. I made the mango pound cake and it had a weird taste. i was hoping it would taste better a few hours later, because i’ve noticed when I bake the taste can change a few hours afterwards or a day later, but the taste didn’t change. I really love your show and the food you make looks delicious, I hope this is just one of those things. I find I have to be really precise with measuring baking soda in recipes that use both baking soda and baking powder as too much baking soda can leave a strange taste. Hola Pati! Thanks for this great recipe. Do you think I could use coconut extract instead of almond extract? Gracias and I love your show!! Me encanta tu programa , tus recetas fantásticas !!! Y disfruto cada vez que viajas y compartes lugares hermosos de nuestro país . Thank you for all your recipes and for showing a positive side of our culture . Hice el mango pound cake para una cena de bienvenida a unos amigos Alemanes, quedaron “fascinados ” con el postre, lo compararon con la mejor repostería europea, yay!!! I live your show a lot..l love black bean also love them …Your recipe’s rock!!! Thank you so much Felisha! I just made this cake last night and was so excited to as the episode that this cake is featured in was my first for Pati’s show and now I’m hooked and have bought her cookbooks as well. This mango pound cake is delicious, but, I think I may have added a bit too much almond as it does overpower just slightly. I didn’t have the full 1 3/4 cups of frozen mangoes but I did add mango nectar to the mix which gave it great flavor! Love watching your show Pati and you’ve sparked my interest in Mexican cooking even more! Hi Migdia, here is a recipe for black beans: http://patijinich.com/recipe/black-beans-from-the-pot/. You can use a pressure cooker, but you may need add a bit more water and cook them for a bit longer. Enjoy! Have made this cake twice and each time got rave reviews. So happy to hear that JR! I made this yesterday and it is delicious. I used fresh, ripe mangos and substituted sour cream for the buttermilk as I was didn’t have any on hand. The cake is full of mango flavor and moist. I’ll make this again! What about canned mango in juice–think that would work?? The tarickyste of this cake was very bland. Maybe my frozen mango that thawed didn’t have enough flavor. The almond can be tricky because if used too much it cuts through everything. I don’t know —this recipe just was not a winner.